Let’s face it, it takes the right combination of hard work, luck, timing and presentation, but to some extent, it’s an art form. Money is a weird thing. Credits. Currency. Whatever you want to call it. Its a hard to make money, but out of thin air it can be made. Perceived value. This is the basis of all money or currency. If no one believes in the system its all for not. P.T. Barnum the best American showman and businessman of his time and shaped our culture today. 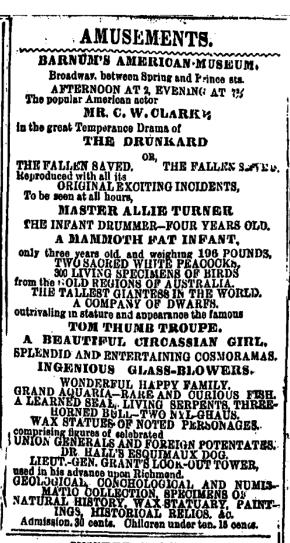 Barnum is widely, but erroneously, credited with coining the phrase “There’s a sucker born every minute“. but I will give him credit for it. Barnum used the museum as a platform to promote hoaxes and human curiosities such as the Feejee mermaid and General Tom Thumb. The circus business was the source of much of his enduring fame. He established “P. T. Barnum’s Grand Traveling Museum, Menagerie, Caravan & Hippodrome”, a traveling circus, menagerie and museum of “freaks“, which adopted many names over the years. P.T. Barnum had an interesting viewpoint on getting money. He charged very little, but many times, over and over, and kept people coming back with new attractions. In “the art of money getting” it seems Barnum was inspired by the penny shows in London, and came back to the US and had similar shows. Barnum had a very interesting way of looking at things; he was a master marketer! I very much like his idea of “there’s a sucker born every minute.” It just exemplifies the idea that you don’t have to be the expert, you just have to know more than they do, and idea that Tim Ferris in the Four Hour Work Week promotes, this doesn’t mean being a fake fraud, but it does me that you can learn and become the expert. Potential customers hadn’t seen his spectacles and they would pay, almost out of curiosity and a desire to be entertained. So if someone has means to pay 5 cents to see a show, he will charge that, and because the people hadn’t seen it before, they didn’t ask for their money back. Ta-Dah, he’s making money. Great audio book. Very interesting to listen to while you do something else, very good book on financial wisdom. Barnum was on to something.